Our tailored waste schemes include the collection of all types of used car and tractor tyres. We have excellent industry contacts with firms who reuse the tyres and can arrange collection form your farm. To find out more and to arrange a collection, call Helen on (01664) 444 189 or use our form detailing the size and number of tyres. 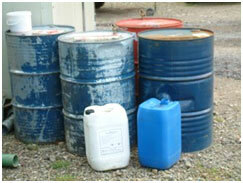 To make it as easy as possible to manage your farm waste, we now collect waste oil. Waste oil can be stored in a tank, 200-litre containers or any containers which can be easily accessed by a tanker for removal. Once you book a collection, we will make all the necessary arrangements. Our comprehensive service means we will register you with the Environment Agency if necessary and provide all the relevant paperwork.